Doing the laundry can be hard on the environment, and many people resist changing the methods and products they use. The supermarket presents a bewildering number of choices, so many people buy one brand and stick to it, perhaps even the brand your mother used. But there are also lots of easy ways to make your laundry habits greener. One way is to use cold water as often as possible. This will have the additional benefit of saving money on water heating. Another good habit is not to use too much detergent. More is not better. Use white vinegar for fabric softener. I never used fabric softener in the past, but when I heard about this and tried it, I liked it. Vinegar cuts any soap residue and leaves clothes smelling clean. Avoid detergents with phosphates, which feed algae blooms that consume oxygen in water and kill native fish and plants. Buy one of the “eco” brands of detergent to be sure you’re not adding unnecessary chemicals to the water supply. Or make your own laundry soap. Not many people will take the time to make their own laundry soap. But in addition to kicking your eco-credibility up a notch, it represents a pretty big savings. My colleague, who gave me this recipe, found that one recipe of homemade laundry soap yields enough for 288 loads of laundry, and costs around 3 cents a gallon, or a savings of $70. 1 bar of soap (whatever kind you like; any bar soap will work, but I use Zote from the Hispanic stores, just half a bar; it's real soft for grating. Put about 4 cups of water into a pan on your stove and turn the heat up on high until it’s almost boiling. While you’re waiting, start shaving strips off of the bar of soap into the water, whittling it down with the knife. Keep the heat below a boil and keep shaving the soap. Eventually, you’ll shave up the whole bar, then stir the hot water until the soap is dissolved and you have some highly soapy water. Put 3 gallons of hot water (11 liters or so) into the 5-gallon bucket. (The easiest way is to fill up three gallon milk jugs.) Mix in the hot soapy water, stir it for a while, then add 1 cup of the washing soda. Keep stirring it for another minute or two, then add ½ cup of borax if you are using borax. Stir for another couple of minutes, then let the stuff sit overnight to cool. And you’re done. 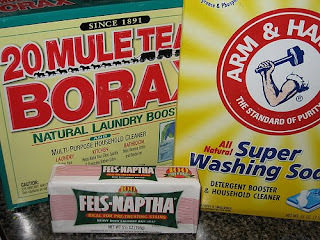 Use care with borax. It can irritate the skin, and don’t ingest it! I don’t use gloves. I am just careful not to have a lot of contact. Borax is also a great application to get rid of ants. When you wake up in the morning, you’ll have a bucket of gelatinous slime that’s a paler shade of the soap that you used (in my case, it’s a very pale greenish blue). One measuring cup full of this slime will be roughly what you need to do a load of laundry, and the ingredients are basically the same as laundry detergent. Thus, out of 3 gallons, you’ll get about 48 loads of laundry. 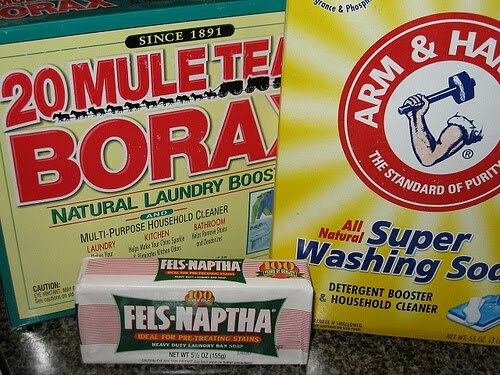 If you do this six times, you’ll have used six bars of soap ($0.99 each), one box of washing soda ($2.49 at our store) and about half a box of borax ($2.49 at our store, so $1.25) and make 288 loads of laundry. This comes up to a cost of right around 3 cents a gallon, or a savings of $70. The glop does not have the smooth consistency of commercial detergent. I have used a whisk to make it, and while it results in a smoother product at first, over time it separates a bit. I just keep a whisk handy to re-stir. Even if it does separate it works fine.